These Monitor Stands are the Best for Those Who Travel! 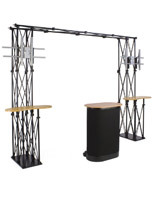 Ready to Ship Monitor Stands on Sale that Support 46" TVs Make Great Booths for Trade Shows! Display Your Flat Screen Plasmas in 2 Layouts! 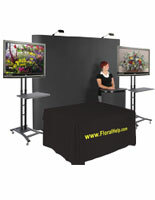 Portable booths use transport case as additional counter for greeting or merchandise! 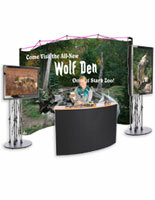 Trade show displays can hold (2) plasma or LCD TVs up to 60" that weigh less than 80 lbs. 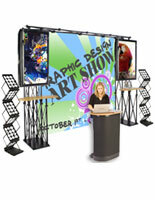 Large 8' x 8' 720dpi custom graphic draws passersby into your booth with ease! 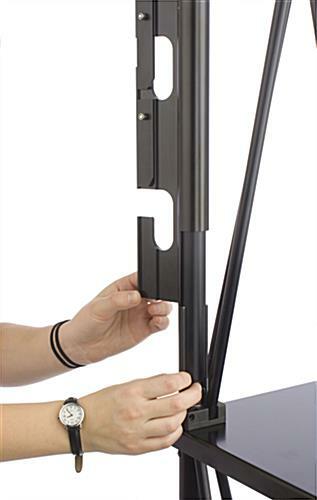 These monitor stands can hold (2) up to 60" TVs weighing less than 80 lbs. 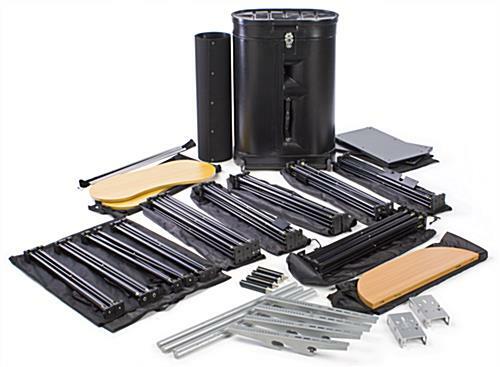 The brackets include the necessary hardware to mount most televisions, though some may need specific screws available at your local hardware store. 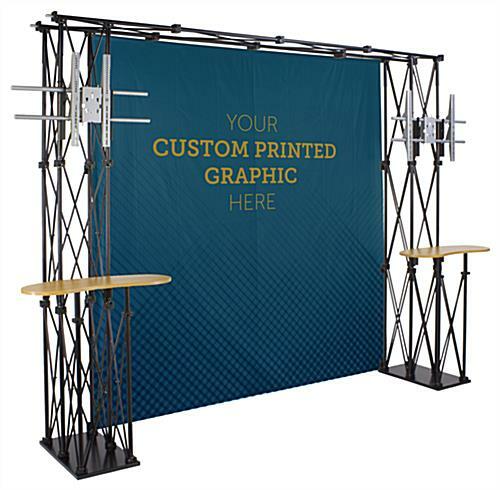 Portable exhibit booths, monitor stands include (2) counters on each truss side for presenting or placing supplemental information, like brochures or merchandise. These counters feature a kidney bean shape and are 31" wide. Monitor stands that support 46" TVs enable you to create an intriguing booth that will help you capture the attention of passersby. 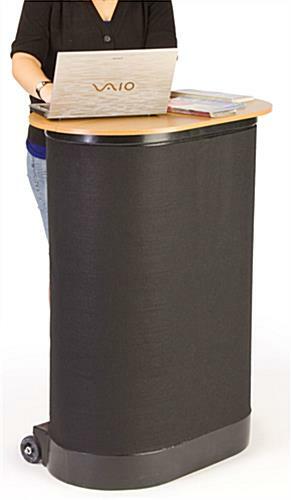 Purchase these monitor stands today to help draw customers in by combining conventional graphics with modern technology! The portable booths, monitor stands have an 8' x 8' custom 720 dpi graphic included that will really draw attention to your booth. This graphic is attached to the display using (11) 2" x 2" hook-and-loop squares positioned around the truss. 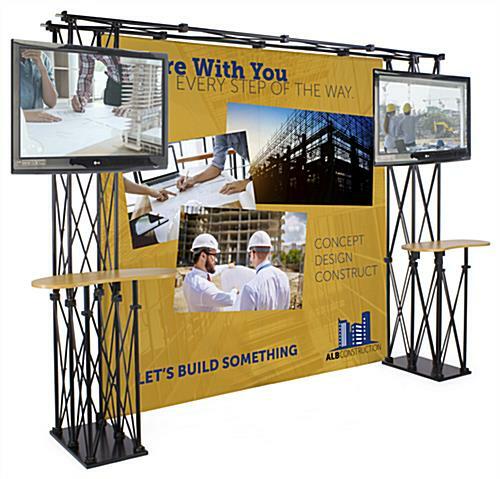 Portable exhibit booths, trade show exhibits and other monitor stands have a collapsible truss designs to easily assemble the units with the provided instructions. 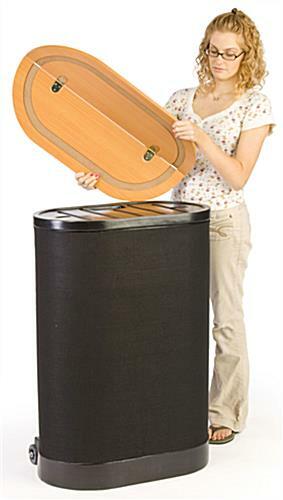 You can store this display in a compact area due to the sleek design. 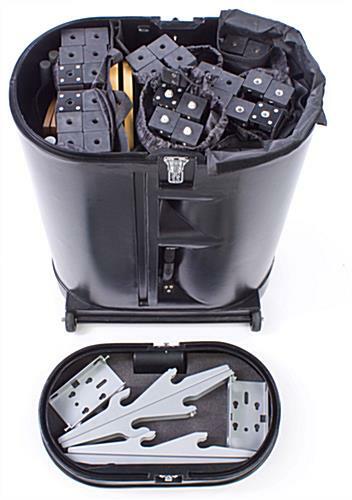 Monitor stands also include a transport case to effortlessly bring this portable display to and from events. 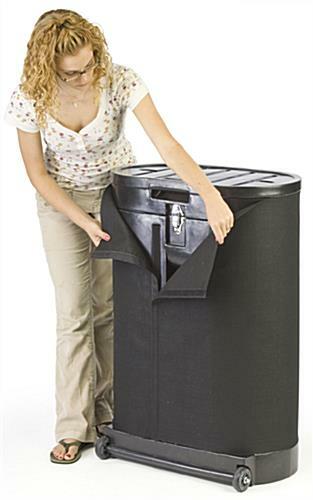 This case also acts as an additional counter by placing the provided countertop on this portable case. These monitor stands are engineered to hold a large variety of television brands including Samsung, Sony, Toshiba, Panasonic, NEC, LG, and Sony. The quality monitor stands with brackets for 46" wide screen televisions eliminate the need to rent furniture at your next trade show. Your customized back drop will guarantee your display stands out from the rest! 29.3" x 37.5" x 18.3"
134.0" x 93.0" x 24.0"